Welcome to Resnet Data Recovery. We specialize in professional data recovery (data retrieval) and data destruction (data sanitization) from servers, NAS and RAID volumes, PC (personal computer) and laptop hard disk drives (HDD), external hard drives, solid state drives (SSD), Mobile Devices (smartphones, mobile phones tablets, PDA’s and cellular phones), backup tapes (tape cartridges), CDs and DVDs, memory sticks (flash drives), SD cards and almost all other types of digital data storage devices. This include data recovery from electro-mechanically failed hard drives, dropped hard drives, data corruption, virus infections, data deletion, formatted drives, old data tape cartridges, to multiple hard drive failures on your RAID volume – no matter what your data loss situation looks like; we strive to have a solution to help recover your data! Resnet has been in the data recovery industry for over 7 Years and our expertise is trusted in South Africa and throughout the rest of Africa. We are constantly striving for excellence in all areas of our service – you can therefor rest assured that your data is in professional hands. Our facilities include data recovery and data destruction specific test and repair tools, equipment and software, including a class 100 clean room for the stripping, rebuilding and recovery of all types of electronic media including, tapes, server drives, RAID volumes, PC and laptop hard disk drives, flash memory as well as mobile device memory chips. This combined with a team of experienced data recovery professionals, working in a secure environment, working under a non-disclosure agreement will give your data the best possible chance of being revived or destroyed in full confidentiality as fast and in a good condition as possible. Damaged hard Drive? STOP! 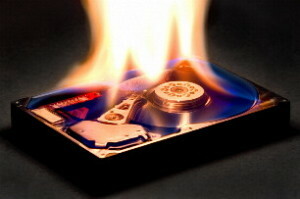 Don’t make it worse!Trust your hard drive to Data Recovery professionals! Hard drive failure can be divided into two categories namely, Logical (software related) and Electro-Mechanical (hardware related) failure. Formatted hard drive(s). Formatting a hard drive (HDD) involves the operating system preparing a hard drive or partition for initial use. In theory, “deleting” the data that was on the drive / partition. When a drive becomes formatted it normally leaves the data on sector level which is in most cases recoverable by specialized software. Deleted file (s) and/or folder(s). Accidental/intentional deleted directories and/or files. Corrupt partition(s) or partition damage. Partitioning refers to the act of dividing a hard drive into multiple or single logical storage units (partitions) onto which data can be stored. This allows you to have multiple virtual “disks” on one hard drive. Once these partitions become corrupted or damaged operating systems are not able to read the data from the volumes and normally suggest that you format your hard drive. Virus infection. Viruses are malicious software that can delete your data or even corrupt your files. Virus infections are a very common cause of data loss and we strongly suggest you install reliable anti-virus software. Reinstallation or reload. Reinstalling an operating system on your computer involves formatting the hard drive and reloading your operating system’s files onto your hard drive. In most cases once this has been done you will not be able to access the data that was on the drive prior to the format reloading process. Hard drive makes a clicking noise. Clicking (clacking, knocking) noises are normally as a result of firmware corruption, broken or damaged reading heads or even platter damage. Typical scenario would be a dropped hard drive. Seized motor. Motor spindle seizure (platter seizing) refers to the platters of a hard drive not being able to spin up and thus the drive is inaccessible. This is also commonly caused by the drive received a hard knock (dropped). Hard drive not spinning / dead hard drive. The drive fails to spin when power is applied (attached) to the hard drive. This is normally caused by electrical damage to the PCB (printed circuit board) in the form of power failure / power surges / spikes / lightning damage. Hard drive spinning up and then down. When power is applied to the drive it starts to spin up and then spins down and repeats. This is normally caused by the platters of the drive not spinning at the correct speed or the hard drive failing to pass its initialization process. Hard drive contamination. Hard drives are extremely sensitive to contamination. This is one of the reasons we have a class 100 clean room where we can safely open hard drives without the risk of external contamination. Once a drive has been opened in a non-clean environment the risks for data loss are very high. Typical scenarios we encounter are: fingerprints on the surface of the platters and dust contamination. Reading heads crash. (Commonly referred to as hard drive or head crash) This concept refers to the reading heads on a hard drive getting stuck on the surface of the platters or physical damage to the heads of the drive. The damage is normally caused by rough handling or manufacturing failures. Typical scenarios would include: the hard drive being dropped or received a hard knock (impact) and component failure resulting in the heads touching the surface of the platters. Firmware corruption. Each hard drive has its own unique firmware which controls its hardware and without properly functioning firmware will be unable to function. Firmware corruption can be caused by manufacturing problems, self-corruption due to everyday use of the drive or even unskillful firmware updates or incorrect use of professional software (human error).